The traditional four seasons of the temperate zone are a deeply rooted concept in North American and European traditions. Those who live in temperate climates tend to think that the tropics have little or no seasonality. This is true only in the wettest equatorial areas, where daylength and temperatures vary minimally through the year. There are only rainier and less rainy seasons. But in the semiarid, nonequatorial tropics there are many seasons defined by temperature and rainfall and marked by a succession of flowering plants. 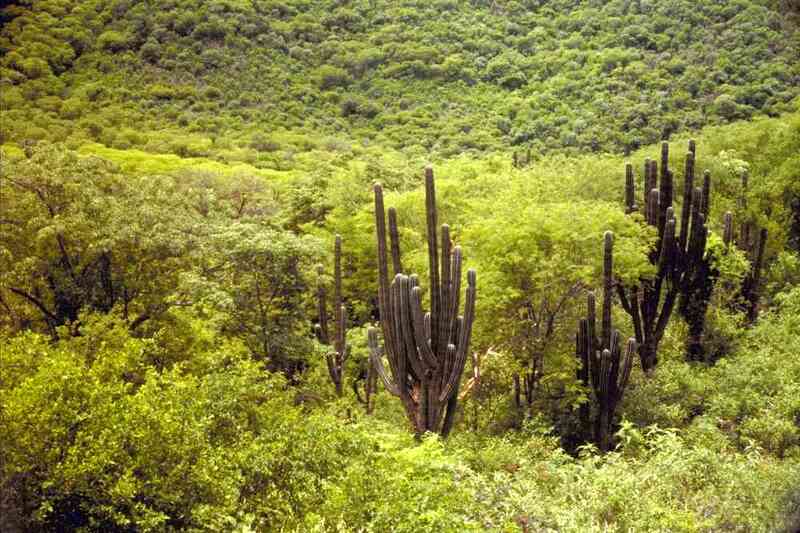 In Alamos there is a noticeable change in season and in the appearance of the vegetation about every 6 weeks. Water is the primary limiting resource in the tropical deciduous forest and phenological patterns are stronger than in wet forests (Bullock 1995, Holbrook et al. 1995). Phenological responses are both vegetative (leaves, root or stem growth, etc.) and reproductive (flowers, fruits; Bullock 1995). Here, as in thornscrub and desertscrub, most plants avoid drought in one way or another. Phenological responses differ among different life forms and within species due to microhabitat variability in soil moisture (Bullock 1995, Medina 1995). The primary responses to moisture changes are leaf abscission at the beginning of the dry season and fine root growth and leaf bud break after the first major rain (Bullock 1995, Holbrook et al. 1995). The cumulative transpirational demand imposed by leaves far exceeds the storage volume of even a large tree. Thus, it is less expensive to be deciduous because evergreen trees have thicker, heavier leaves, deeper roots, and a greater investment in xylem transport systems (Holbrook et al. 1995). Deciduous trees respond to rainfall much faster than evergreens. The phenological patterns are somewhat more complex in the southern Sonoran forests because of the secondary winter rainfall from Pacific fronts. Unlike more southerly TDF, the primary wet season of about three months beginning in late June can be extended by occasional fall tropical storms and, in most years, modest winter rains into January or February. March through early July is typically dry, with heat building to a peak in June. Many deciduous plants drop their leaves promptly at the end of the primary rainy season in late September, while others retain part of their foliage well into the spring dry season depending on how much winter rain falls. The blooming of most tropical deciduous tree species that flower in the dry season is essentially uncoupled from available soil moisture in southern TDF (but see next paragraph). Full hydration of the terminal branches is required for trees to flower, utilizing water either stored in the trunks or extracted from the soil. In some cases the stem water content of trees is higher than associated arborescent cacti (Holbrook et al. 1995). 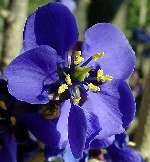 Most trees flower for less than six weeks (Bullock 1995). In the northernmost TDF of southern Sonora, several tree species require a pulse of rain in order to flower. For example, Tabebuia impetiginosa will flower up to three or four times in response to rainfall events from December to March. Populations of the same species farther south do not need a winter rain trigger to flower. At the beginning of the summer rainy season, deciduous trees respond first by rapid (within three days) growth of fine roots which help with water and nutrient uptake followed by leaf buds breaking within a week (Bullock 1995, Cuevas 1995, Holbrook et al. 1995). The leaf buds are not really dormant but in a "state of drought-imposed rest" (Holbrook et al. 1995). Productivity of the roots can match the aboveground production (Martínez 1995). 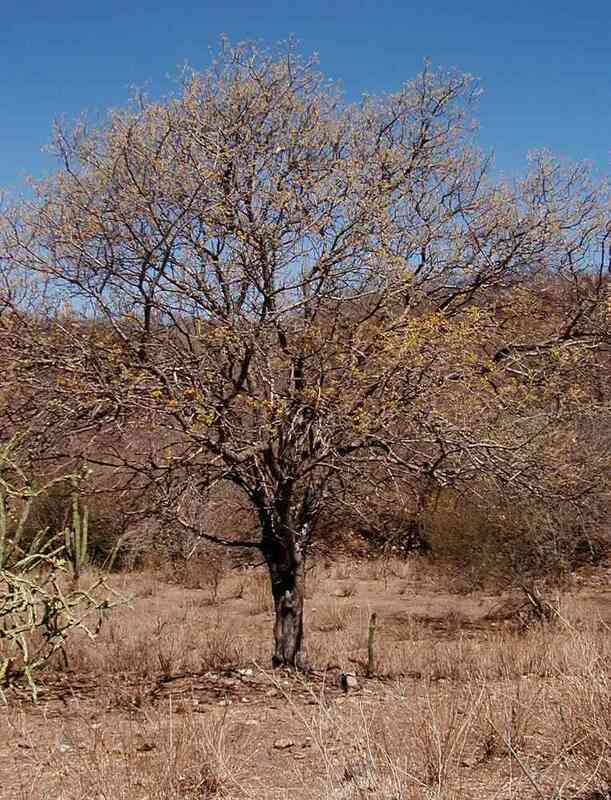 There are a few wet season deciduous species such as San Juanico (Jacquinia macrocarpa) that have sclerophyllous leaves that persist through the dry season. 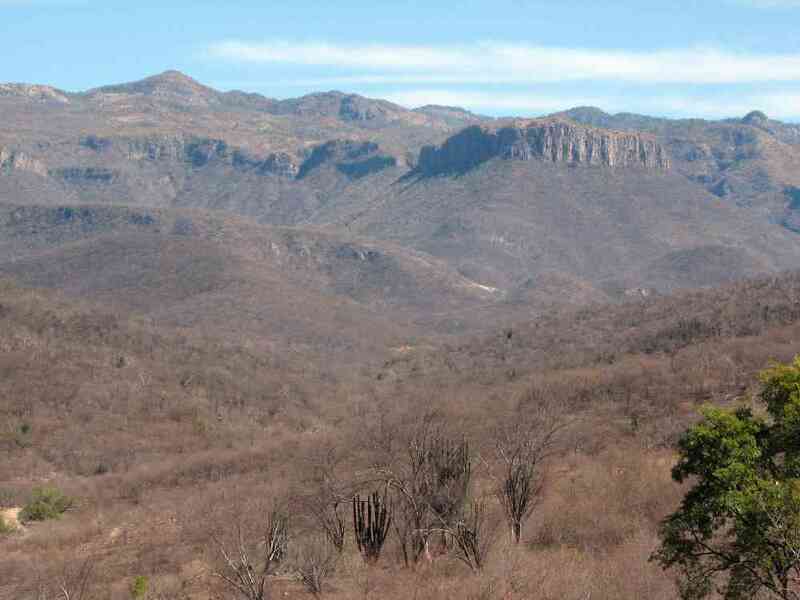 The most dramatic change in the color of the landscape is at the beginning of the summer monsoon in July when the forest changes from monte mojino, the distinctive reddish-gray-brown color of the dry season, to monte verde, the bright, green of new leaves. Gentry (1982) poetically described the "long spring dry season forest" as a "...dreary scene: a naked infinite host of trunks and branches, spreading interminably over the volcanic hills and mesas, bared to the fiery sun, under which the last leaf seems to have withered and died. He who walks this land in the month of May walks with a parched throat." The mojino color is predominately due to the reddish brown bark and persistent pods of mauto (Lysiloma divaricatum) and palo piojo (Brongniartia alamosana), the leaves of vara prieta (Croton flavescens) and vara blanca (Croton fantzianus), or the red bark of torote prieto (Bursera laxiflora). This season is not totally colorless. A few trees flower at the peak of the drought just before the rains begin (see winter-spring flowering season below). In July the relative calm of the tropical deciduous forest is shattered by monsoonal thunderstorms with strong winds and heavy intense rain. Overnight the forest becomes browner as the winds of the first storm strip the last yellow leaves clinging to the trees. Within a week to ten days, leaf buds erupt, metamorphosing skeletal trees into a dense verdant canopy. The bright green of new leaves darkens as they mature over the next few weeks. Even then, the green of the forest is far from uniform with especially dark green leaves on figs (Ficus spp. 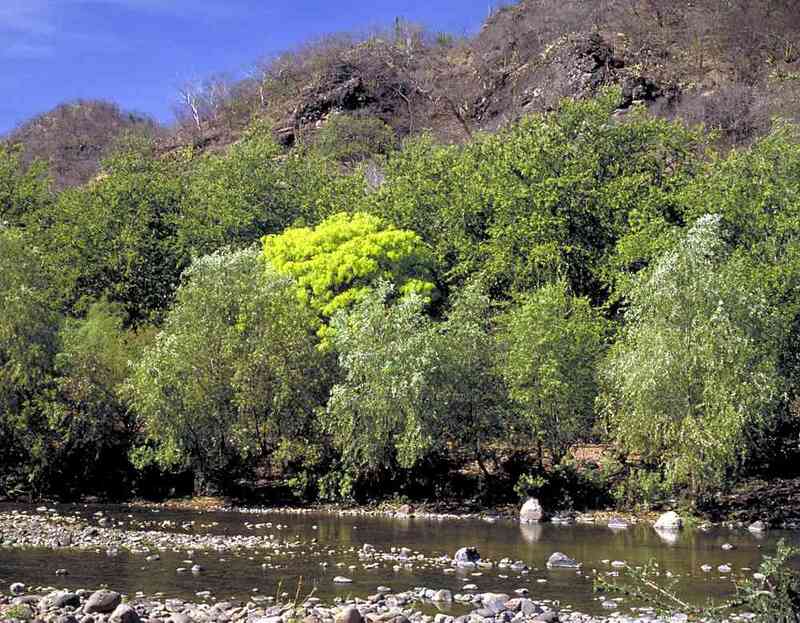 ), guayacán (Guaiacum coulteri), matachamaco/palo verde (Agonandra racemosa), and San Juanico (Jacquinia macrocarpa pungens). The swollen-trunk torotes (Bursera, Jatropha) have tiny flowers that are often difficult to see and certainly not showy. A sharp observer would find that the first summer rains in July trigger flowers in torote incienso (B. penicillata), torote copal (B. lancifolia, B. stenophylla), torote de venado (B. fagaroides), torote papelío (Jatropha cordata), torote prieto (B. laxiflora), and tree ocotillo/jaboncillo (Fouquieria macdougalii) as their new leaves simultaneously turn the hills a jade green. Palo mulato (Bursera grandifolia) is alone among these with its masses of still tiny but showy pink flowers. 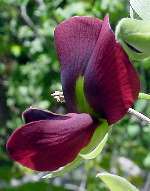 Brasil (Haematoxylum brasiletto), a distinctive small leguminous tree with a strongly fluted trunk, blotched gray and brown bark, and reddish heartwood, is one of the few plants with showy flowers in the summer rainy season. Although some individuals begin flowering as early as March, most plants have bright yellow flowers in August. 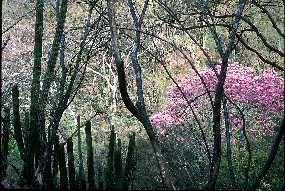 The pink and white flowers of legumes, especially chopo (Mimosa palmeri), are conspicuous against the forest green. Copalquín (Hintonia latiflora) is a locally common tree with azalea-like fragrant white flowers from July to September. By September, herbs and grasses choke the understory and vines cover shrubs and trees. A knee-high layer of herbs covers the ground in the forest understory. Flowers of the various morning glory vines or trompillos range from pink, purple, red, and orange in Ipomoea, to scarlet in Operculina pteripes, and white in Jacquemontia and Merremia. At Arroyo El Mentidero and many areas near Alamos, Ipomoea pedicellaris forms spectacular curtains of large pink-purple flowers. 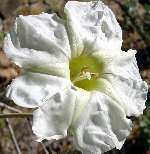 Bitachera (Schizocarpum palmeri) is a common cucurbit vine with bright yellow star-shaped flowers and triangular fruits. As the summer monsoons taper off in middle or late September, the forest begins its secondary dry season with some typical "fall" colors. The leaves of various chilicote/coral bean (Erythrina flabelliformis), sangrengado (J. malacophylla), torotes, torote papelío, tree morning glory/palo blanco (Ipomoea arborescens), and tree ocotillo turn yellow and begin to fall. Palo mulato and palo colorado (Caesalpinia platyloba) turn maple-red, and buttercup tree/palo barril (Cochlospermum vitifolium) brilliant red and yellow. 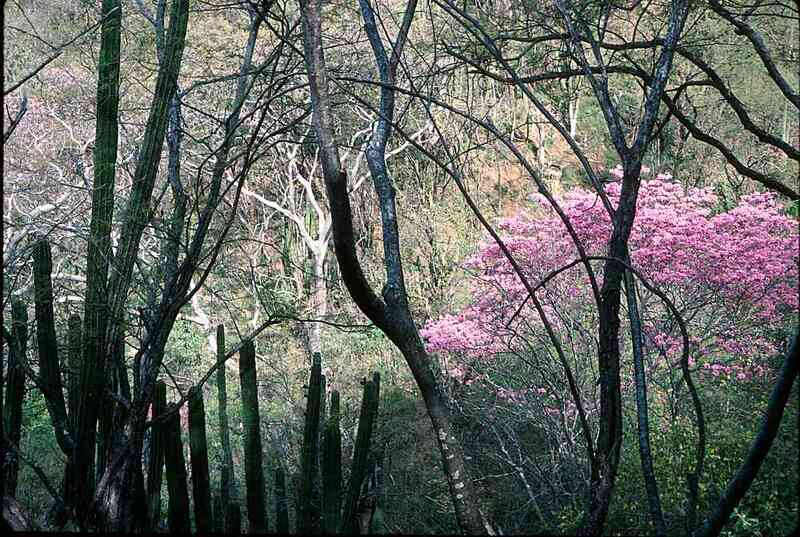 For these trees, the deciduous season begins at this time and not at the end of the winter rainy season while the leaves of amapa (Tabebuia impetiginosa) and most of the legumes remain green. Through the fall and winter, the partially-deciduated forest is a mosaic of greens and browns. The final shift to the dry season monte mojino comes at the end of the winter rains in January or February. In the dry season from January to July, the appearance of the forest changes dramatically every six or eight weeks --- the "winter-spring" and tropical dry seasons combined. 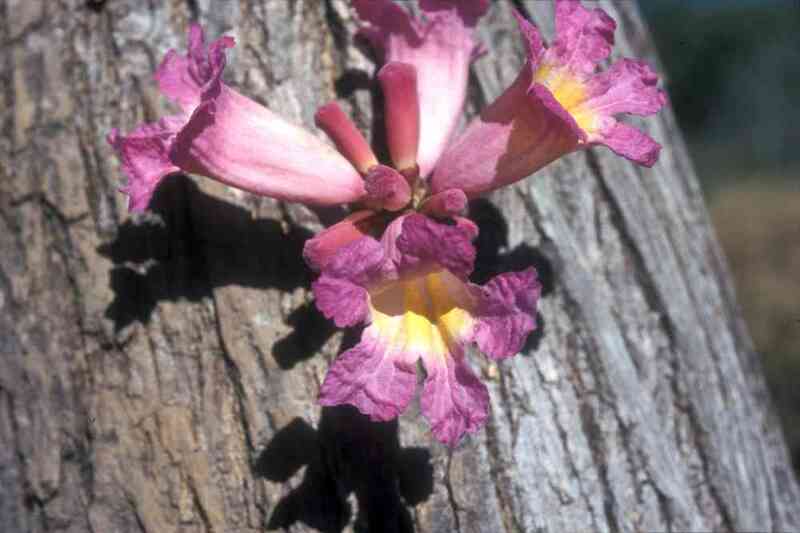 Showy flowers, so conspicuous against the monte mojino, rivet the attention of visitors to particular tree species. Most of them disappear into the obscurity of the forest after their turn on stage. 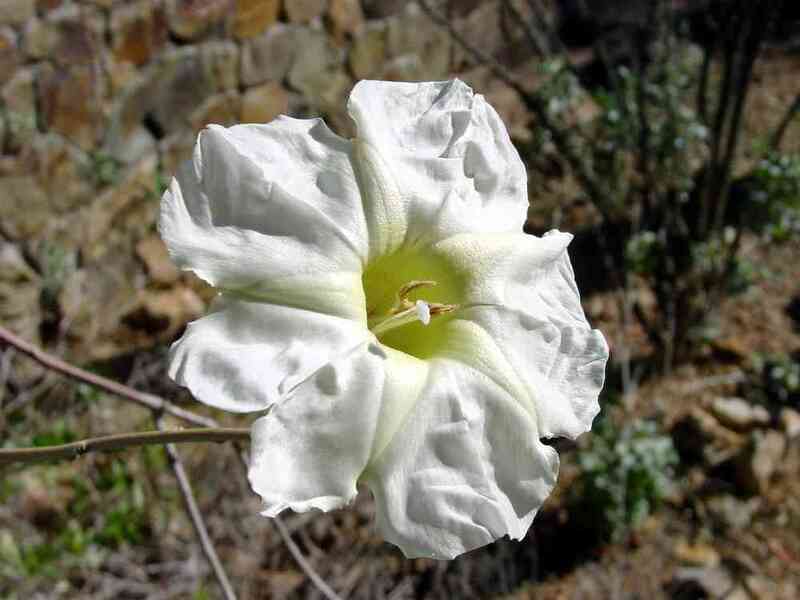 From (October) December to April, tree morning glory, "a spectacular tree 7-10 m high, smooth pale bark like the hide of a hippopotamus" holds "a high, thin spread of white corollas like stars against the morning sky. These stars soon fall upon the ground, where deer eat them" (Gentry 1942). The small size of local Sinaloan whitetail deer (Odocoileus virginianus ssp. sinaloae), allows them to move in dense tropical deciduous forest with ease. Beginning in December and lasting through February (or April), brilliant torches of pink amapa flowers illuminate the landscape. Peaking in March, buttercup tree is especially showy with its crown of huge, bright yellow flowers against the sky atop large trees with smooth, silvery-gray trunks. 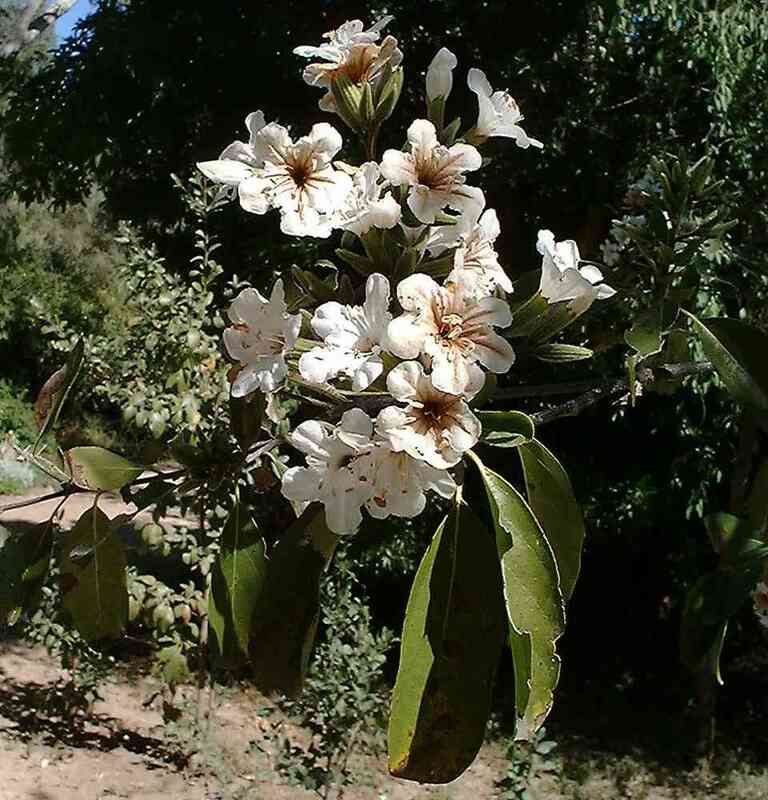 Also in March cuajilote (Pseudobombax palmeri) is conspicuous on cliffs with its elegant white flowers with many erect stamens and pendulous strap-like petals against the smooth, ruddy bark. March is also the time when oak woodlands are most easily discerned from a distance because the leaves turn reddish-orange and brown before they fall and the trees flower. Palo de asta (Cordia sonorae) is a slender tree with gray bark that is common and widespread, often occurring in groves in the Alamos area. In early April it has clusters of large white flowers that soon turn the color of coffee. In middle to late April, palo zorillo (Senna atomaria), a common small tree with abundant yellow pea flowers, brightens the landscape. 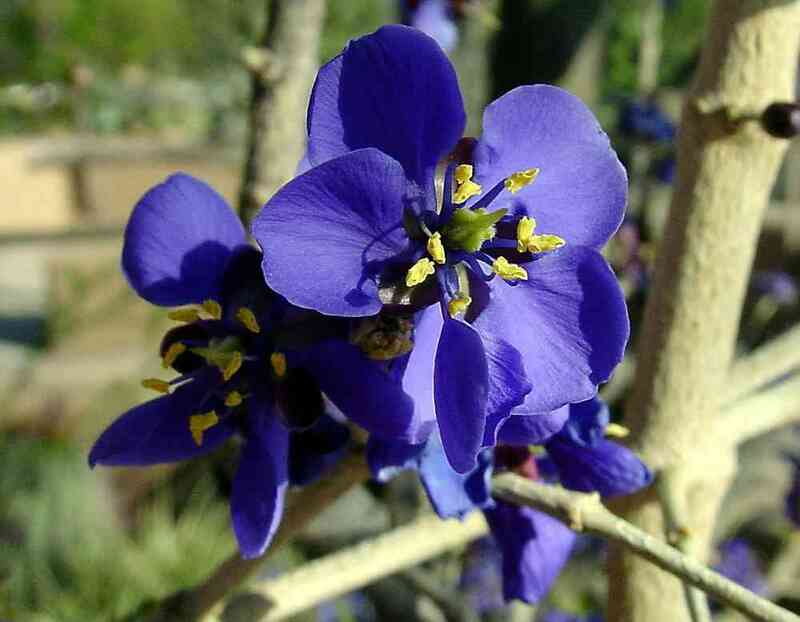 In May the dark green leaflets of guayacán are covered by sprays of intense purple-blue flowers. In late May nesco (Lonchocarpus hermannii) is clothed with masses of magenta flowers. The rest of the year this common tree with its smooth gray bark and ropy trunk blends into the forest. By early June, kapok/pochote (Ceiba acuminata) is in full bloom with large strap-like white flowers. This tall tree with a broad canopy is readily distinguished by the heavy, laminated, pyramidal thorns on its trunk. The fruits develop through the fall, and persist after the leaves fall bursting into pendulous white cottony balls of fluff at least until March. The fibers have been used to make pillows, cushions, and life preservers. 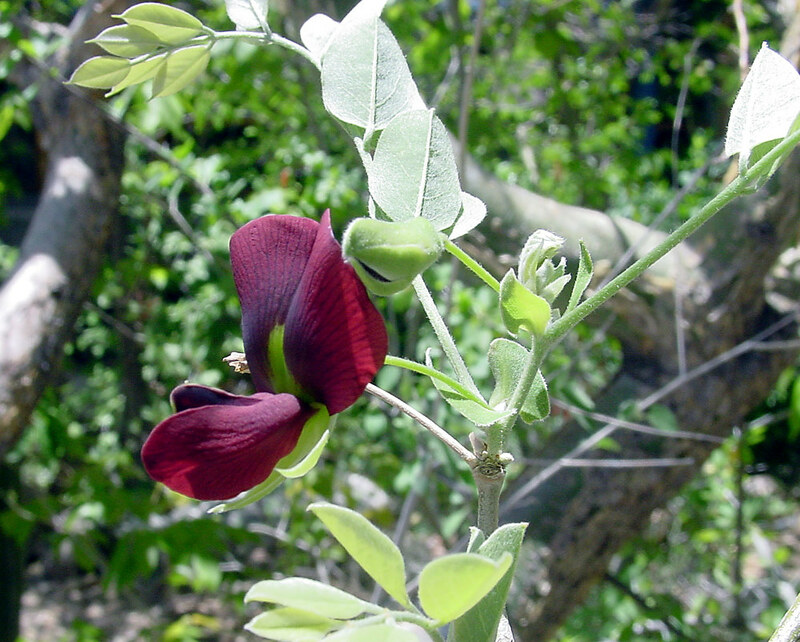 In the heat of middle to late June, palo piojo, a common small legume tree often occurring in groves, displays a peculiar dark brownish-maroon flower. 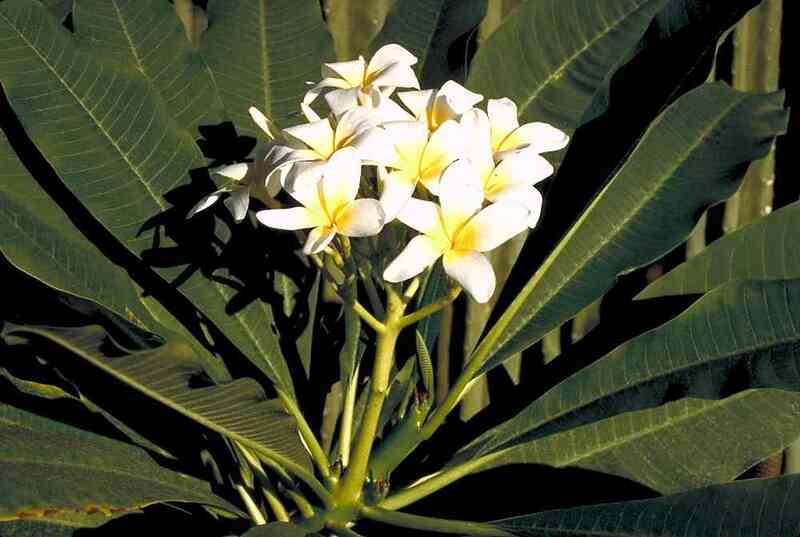 Frangipani, cascalosuchil (Plumeria rubra), an especially common shrub on the ledges and shelves above arroyos, has very large white flowers that appear on leafless, candle-like stems in June and July. Unlike cultivated forms of this species from more tropical portions of its extensive range, the flowers are not strongly fragrant. 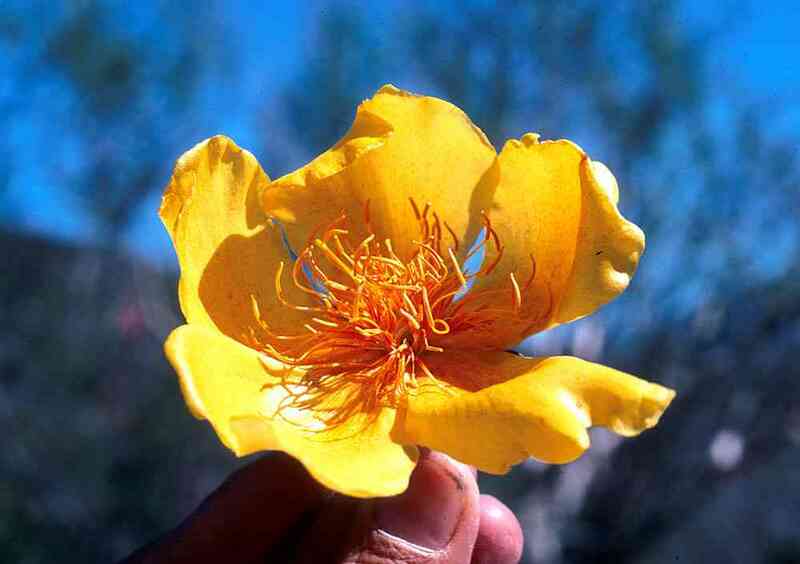 A number of trees and shrubs flower when the forest is most barren in the desert-like conditions of May and June. They typically have small flowers, likely pollinated by bees and flies, and belong to such families as Erythroxylaceae, Rhamnaceae, Sterculiaceae, and Ulmaceae. 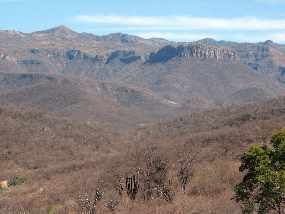 This group includes cacachila (Karwinskia humboldtiana), Colubrina triflora, desert hackberry, cumbro (Celtis pallida), netleaf hackberry, cumbro (C. reticulata), tropical hackberry, garambullo (C. iguanaea), guásima (Guazuma ulmifolia), and mamoa (Erythroxylon mexicanum). In June or earlier tepeguaje (Lysiloma watsonii) is visible in unsuspected numbers, not because of its flowers, but its conspicuous bright green new foliage. It leafs out well in advance of the summer rains and ahead of its more common relative, mauto. When trees break leaf buds before the rains began, a cue such as photoperiod may be involved (Holbrook et al. 1995).